Free Shipping Included! Hisonic HS122B-LL Portable Lithium Battery Rechargeable PA (Public Address) System with Dual Wireless Microphone System and Car Charger Cable, Black (2 Belt-Packs, Black) by Hisonic at IGWT. MPN: HS２２B-LL. Hurry! Limited time offer. Offer valid only while supplies last. 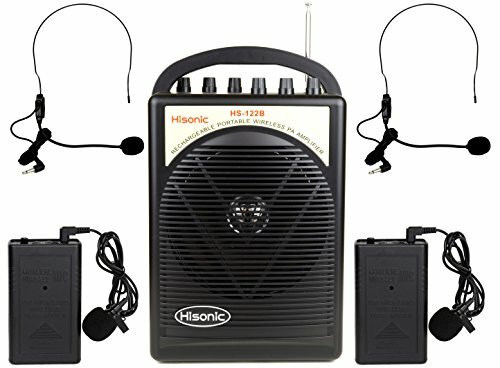 This newly improved model HS122B-LL comes with a Lithium Rechargeable Battery, Dual Channel wireless microphone and super clear 6 inches speaker. This newly improved model HS122B-LL comes with a Lithium Rechargeable Battery, Dual Channel wireless microphone and super clear 6 inches speaker. In order to meet the need of a small group use, this HS122LL is portable , light weight to carry in a customized bag, you can use it in travel to park, seminars and auction meeting. Even some musicians love it to use it as an amplifier of the their music instruments. It is powered by Lithium rechargeable battery that lasts twice longer than lead-acid ,but light in weight, and more rechargeable times. It comes with a car cigarette light cable that you can power the system when you have a car with you, you can use the car battery to run the system when you need it. The long range wireless microphone is perfect for putting on headset or on your neck with a lapel microphone near your mouth. There is no need to assembly this system to use, it is easy , and convenient to use it. It is perfect for school classrooms , stage for dance, church, Gym , anywhere you can think of, just so simple and easy to use it. Some people use it in a store front , some use it in a large warehouse, some people use it in a exhibition.. anywhere you need to be heard, this system will work for you.